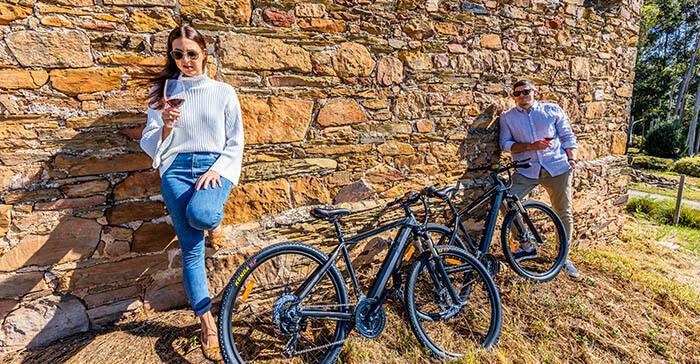 Cruising with ease on our high spec e-bikes at up to 25 km/hr, you’ll go behind the scenes of McLaren Vale’s most iconic wineries and get insider access on this tour. You’ll experience a working winery tour at one of the venues, not normally available to the general public, which lets you learn about small batch winemaking. In another venue you’ll see historic ironstone cellars and taste the region’s most famous varietals. At your lunch venue you’ll visit an exclusive indigenous art exhibition in the private gallery of the owner, plus get a delicious lunch with a glass of premium wine or a selection of craft beers to try. In another venue a dedicated staff member takes you on a sensory journey of their wines, as you look over their vineyards. In the final venue, you’ll learn the Italian heritage of the region and try mediterranean inspired wines. The electric motor starts when you begin to pedal and go up to 25 km/hr. They allow you to conquer hills and cruise through the vines with ease. Hop on one of our state-of-the-art premium e-bikes for an easy ride along McLaren Vale’s Shiraz Trail. Combining the best of coast, wine, and of course regional food, this guided tour packs a powerful punch. Built with the latest technology, your pedal assist e-bike (boasting an impressive 250 watts) makes following the Shiraz Trail a breeze. We’ll provide you with a helmet and pre-ride safety talk – all you need to do is show up and enjoy the ride! We have picked five of the most iconic venues in McLaren Vale for the hosted tour, each of which is different and has its own personal theme. We go to Primo Estate for its Italian wines and olive oils, Wirra Wirra for classic Mclaren Vale varietals and its historic cellars, Red Poles for indigenous art and a delicious lunch, Samson Tall for its historic Chapel and single vineyard wines and Hugh Hamilton for its sensory experience. On top of this you’ll ride ebikes next to famous vineyards and learn tips on the region from your local guide.